As one should probably expect, there was a decent amount of skepticism at Faribault this week when we announced that we would be eating onions. 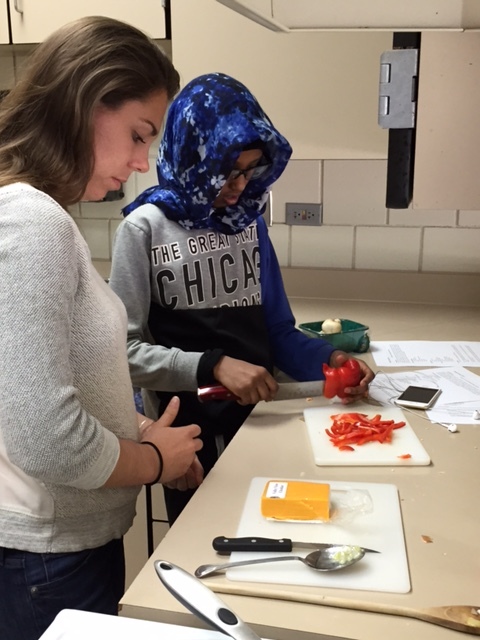 Students recoiled at the thought of tasting the strongly-flavored, tear-inducing vegetable. In their raw form, we explained, onions are not particularly appetizing. However, it is possible to caramelize them so that they are sweet and delicious. It was this golden form that we we dealt with this week. Last week, we used popcorn to focus on the concept of physical changes. To complement this lesson, this week we explored chemical change associated with caramelization. Caramelization is a process in which the long polymers of sugar are broken into monomers, which we perceive to be sweet. This is classified as a chemical reaction, and, for a chemical reaction to occur, molecules must bump into one another. With this knowledge, we asked the students to ponder the effect of heat energy on molecular collisions. Intuitively, it made sense to them that warmer molecules would move faster and bump into each other more; this would make for a faster rate of reaction. Though heat does influence reaction rate, we explained that there are other factors, such as PH, that also impact the rate of reaction. Under normal conditions, onions take a very long time to caramelize. However, with the addition of the a pinch of baking soda, the reaction moves much more quickly. This happens because the baking soda changes the PH of the system and acts as a catalyst for the reaction. We then broke into small groups to see these reactions play out in real life. To better observe the difference between the catalyzed and un-catalyzed reactions, we heated up two pans of onions— one with baking soda and one without. As the reaction was underway, the students remarked at how the onions with baking soda were so much more yellow and got softer much faster than those without the catalyst. 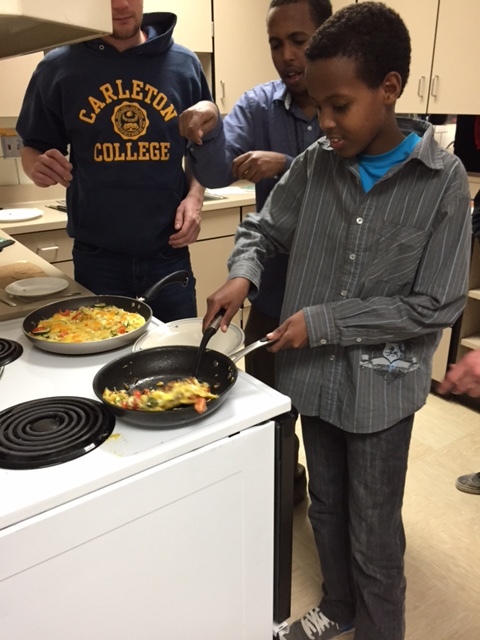 While the onions cooked, we moved on to the part of the lesson that required a little more culinary creativity— omelet making. With the caramelized onions, peppers, tomatoes, zucchini, jalapeños, spinach, avocado, mushrooms, goat cheese, cheddar and feta, the omelet options were virtually endless. 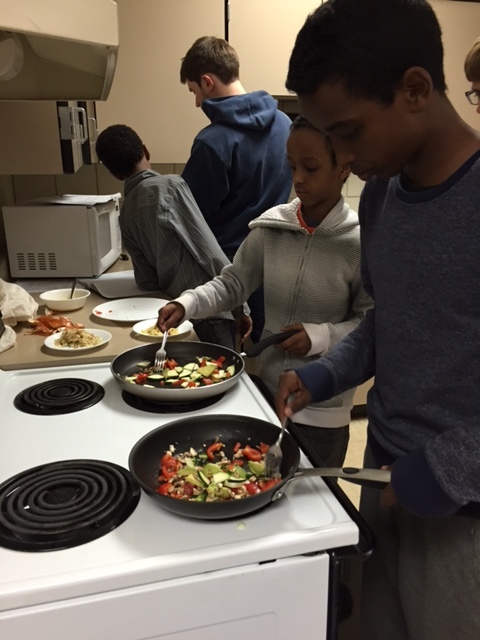 The students seized the possibilities and each group ended up with a delicious and entirely unique creation. This term, we have been having trouble with having enough students to make the program effective. In order to address this issue, we enlarged the pool that we were working with to include eighth grade girls in addition to the boys. Though there was noticeably more chaos in the room, it was refreshing to once again have the degree of energy and enthusiasm for the program. Furthermore, the girls that were new to Young Chefs were fascinated by the science and thrilled by the cooking. In fact, they talked about it enough after the lesson was over that apparently the seventh grade girls are becoming jealous. 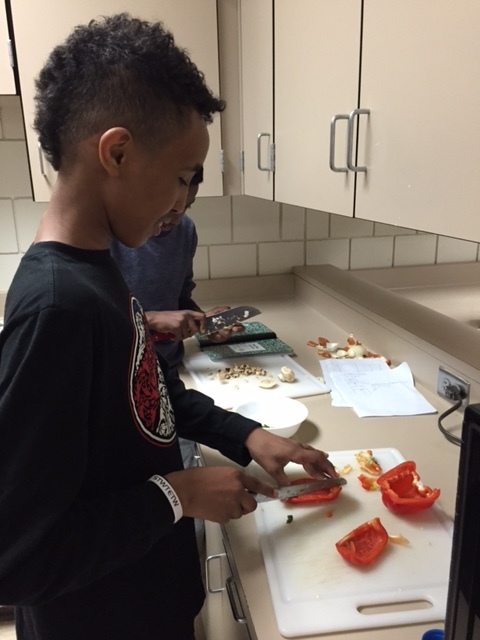 Though their addition does take the program in a slightly different direction, as volunteers we are extremely excited to see the culinary creativity that will naturally arise from having a larger group of students. As the large combined group grinned as they devoured their omelets, it was clear that the chemical transition associated with caramelization wasn’t the only effective transition of the day. 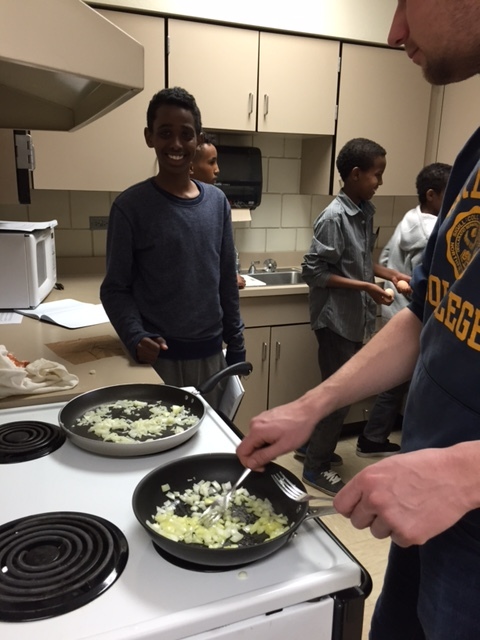 Like the polymers in the pan, the students’ opinions of onions were reshaped and, likewise, the dynamic of the group was rewritten in a promising and exciting new way. I really enjoy reading about this program…I am thinking for high school students too?! That’s a fantastic idea — do you have any specific thoughts on high schools?